Julia Louis-Dreyfus plays Eva, a massage therapist who seems to have more of a connection with her teenager daughter’s best friend than her teenage daughter. Eva is the most complex character because she harbors self-doubt, which comes into full force when she discovers the man she is dating, Albert, is also the ex-husband of one of her new massage clients, Marianne. The comedy is derived from the fact that Eva conceals from Albert that she is getting information about him from his ex-wife (or even that she knows him). And as Eva begins to fall in love with Albert, she second guesses herself by believing Marianne’s tendentious view of Albert. 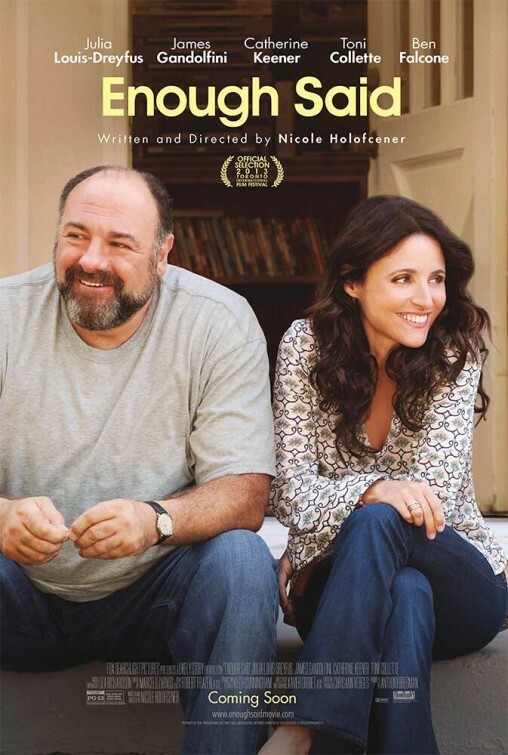 Gandolfini’s performance is the most effective. His blunt but relaxed and to-the-point-though-slightly-resigned countenance carries much of the film’s charm. We like his character, Albert, despite his flaws. He’s not the noblest person in the world, and he accepts that about himself. We want to accept him, too. There is no strong message or theme here, save for the experience of simplicity — or the need for more of it in one’s life — which is something to take note of. The score by Marcelo Zarvos follows this theme as well, and fits the film’s mood perfectly. Simple instruments and melodies make up most of the music and the soundtrack makes for a relaxing stand-alone listening experience. In the end, Enough Said doesn’t have a lot to say, and that’s okay. Perhaps that is the point. We can enjoy it for what it is, a simple, lighthearted romantic comedy to experience for 93 minutes. This movie was screen at my home from an HD rental from Amazon On-Demand streaming. This review was original published on Soundtrack.Net.